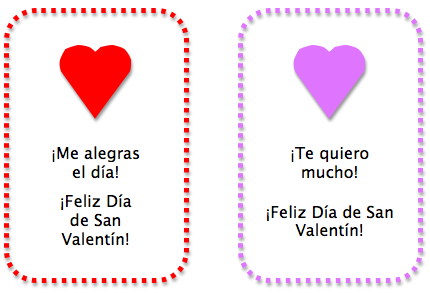 I needed something I could tie to a small treat so I made these little printable Spanish valentines. You can print them on card stock to use as they are, tie to a treat, or glue to a larger card and decorate. Te quiero mucho – I love you a lot. Me alegras el día – You brighten my day. Me haces muy feliz – You make me happy. Me haces sonreir – You make me smile.